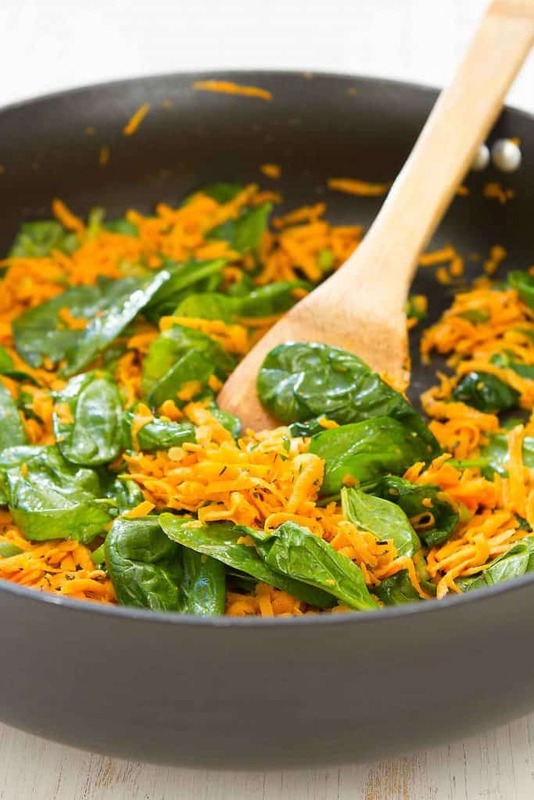 A little sweet and wonderfully garlicky, this sautéed sweet potato & spinach side dish is packed with vitamins and can be prepared in 10 minutes. When fall hits, it’s as though a switch is flipped on my cravings. Watermelon and fresh corn are pushed to the side, and I only have eyes for sweet potatoes and spaghetti squash. Weekday meals are all about Turkey Taco Stuffed Sweet Potatoes and Enchilada Stuffed Spaghetti Squash. And let’s not forget mass quantities of slow cooker sweet potato soup! This garlicky sautéed sweet potato and spinach recipe is the side dish that embodies the spirit of fall cooking. Dried herbs, grated root vegetables and blissfully simple prep, which is welcome whether you’re serving a weeknight meal or a more elaborate Sunday dinner. 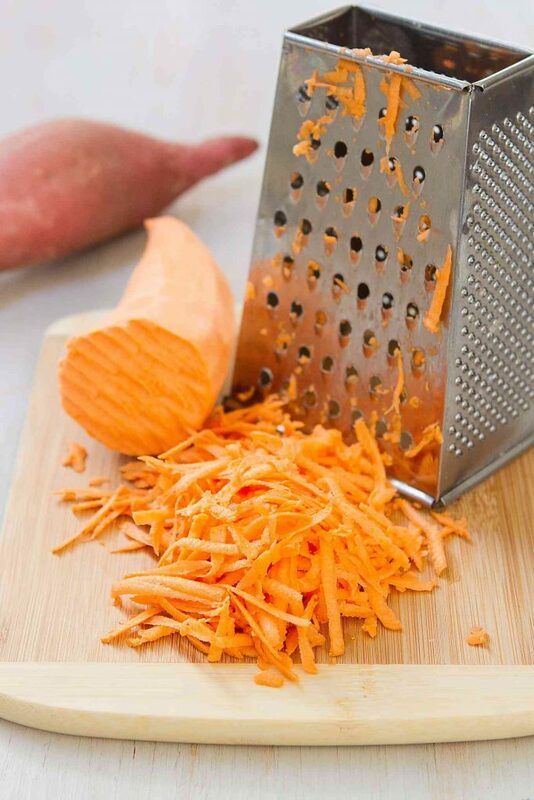 From start to finish, grating the sweet potatoes to scooping this healthy side dish onto the dinner plates, the total prep time is only 10 minutes. Serve it up as soon as possible so that the spinach stays green and slightly perky. As for the health factors, this dish wins on every front. Vitamins A, B6 and C, and potassium and fiber from the sweet potato. Vitamins A and B, iron, fiber and calcium from the spinach. And that doesn’t even cover the anti-inflammatory properties of garlic. 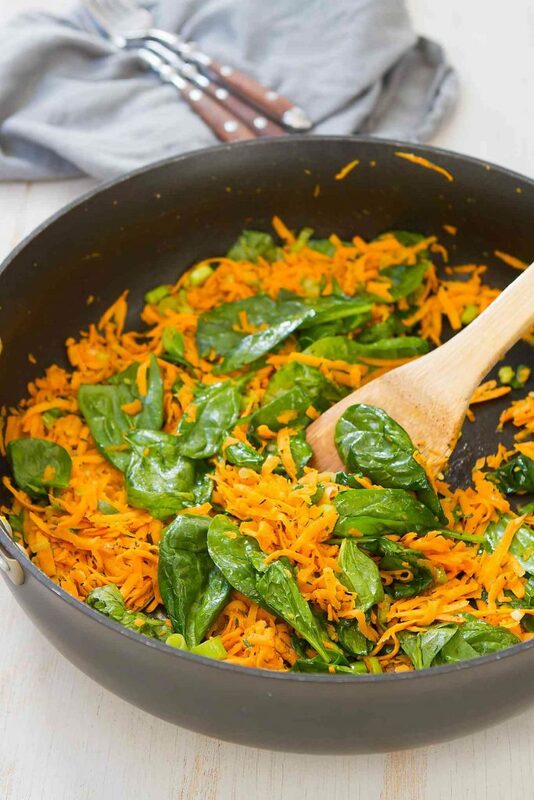 Each scoop of this garlicky sautéed sweet potato dish is a powerhouse of nutrients! Heat 2 teaspoons olive oil in a large nonstick skillet set over medium-high heat. Add the grated sweet potato and white sections of the green onions. Saute until the sweet potato is starting to soften, stirring constantly, about 3 minutes. Stir in the thyme, salt and pepper. Add the remaining 2 teaspoons olive oil, then add the garlic, spinach and remaining green onions. Cook, stirring constantly, until the spinach is slightly wilted, about 1 minute. This recipe looks very delicious! I want to make it at home. But I have one question.Is there any alternative to olive oil? Coconut oil would be a great substitution! I’m not a fan of thyme. What else would work? When doi add the green parts of the onions? I apologize for the omission. The post is now updated. I hope you enjoy it!